This Is Us throws every last care away, goes to the mall... today! There’s a scene towards the end of “Clooney” in which Kate and her support group frenemy Madison have an emotional heart-to-heart about Madison’s eating disorder and Kate’s own self-esteem struggles. “Oh my god!” Madison suddenly gasps. Given that this is This Is Us, I assumed she’d finish that sentence with a moving but slightly maudlin sentiment on which to end the scene. “Should we host a podcast?” she says instead. That moment sticks out both because it’s genuinely hilarious and because it’s so unexpected. Even when the scene does end with a more conventional button of Madison calling Kate her best friend, there’s an element of weirdness to the whole thing (albeit, a very sweet kind weirdness) rather than just pathos. And that typifies “Clooney” as a whole. None of tonight’s storylines ended the way I thought they were going to. I assumed we were in for one if not two scenes of Kate having clothing-related breakdowns; that Randall would get an emotional reunion with one of William’s exes (or at least with William’s beloved cat Clooney); and that Kevin, Rebecca, and Miguel would hash things out in a big explosive scene like last week’s therapy session. But instead of delivering on the promise of melodrama baked into so many of tonight’s plotlines, This Is Us swerves to offer something more grounded. Rebecca describes her relationship with Miguel as being “quieter and older” than the one she had with Jack. And that’s a bit like what “Clooney” feels like too—a quieter, more mature version of This Is Us. After their much-needed therapy session from last week, the Pearsons mostly return to their own individual stories tonight. Kate has her odd bonding experience with Madison; Randall visits William’s old apartment building and tries to learn more about his father; and Kevin temporarily moves in with his mom after being released from rehab. Meanwhile, back in the late 1990s, the Pearsons pull a Robin Sparkles and go to the mall (today!). Tonight’s episode reminded me a lot of “Brothers,” the episode where Jack takes Kevin and Randall camping, Rebecca and Kate visit Jack’s dying father, and Randall takes Dejà to Kevin’s charity auction. Like that episode, this one is hard to sum up in a sentence because there’s not one big event that defines it (it’s not “the episode where Kate has a miscarriage” or “the one where the Big Three are in their 20s”). But both “Brothers” and “Clooney” have a certain effortlessness with which they tell their smaller-scale stories. And they’re both full of well-observed, relatable moments—like the way Rebecca stocks her fridge with all of Kevin’s favorite foods or the feeling of running into someone you know at the mall and sneaking an impromptu hangout into a day of errands. As it often does, the flashback storyline resonates with the present day ones, although this episode doesn’t have one big overarching theme. Instead there are a bunch of subtle connections that befit the episode’s more low-key, “slice of life” approach. Randall is trying to find a new purpose in life following Dejà’s departure, while teenage Kevin is feeling similarly aimless after losing his dreams of being a football star. Elsewhere, present-day Kevin’s coldness towards Miguel is contrasted with the warm, familiar relationship they had back when Jack was still alive. During their food court wallow session, Miguel even helps Kevin and Randall realize just how many of his own dreams Jack gave up to make sure his kids grew up in comfort. As teenage Kevin comes to see Jack as more than just his pep talk-giving father, present day Kevin comes to see Miguel as more than just a Pearson family interloper. Kevin’s hatred towards his stepfather has been a great source of comedy for This Is Us, but “Clooney” finally digs into the tension between the two men. And it provides some additional context for the Rebecca/Miguel relationship too, both for Kevin and for the This Is Us audience. Both Rebecca and Miguel know that Jack was the love of her life, but that doesn’t mean they haven’t found happiness together too. In fact, the quick scene of them making fun of Tiny House Hunters did more to sell me on their relationship than all the previous episodes combined. Kevin finally seems to recognize that Miguel is actually a good partner for his mom too. And after years of acting like a petulant child, he grows up and makes peace with their marriage. The past/present storylines with the most direct connection to one another belong to Kate. And both go a long way to reassuring me that This Is Us has an intentional, nuanced story it wants to tell about Kate’s relationship to both food and her weight. I’d been worried that this season was trying to pass off Hannah Zeile’s heart-shaped face as teenage chubbiness, when in fact Zeile is quite slim. Thankfully, This Is Us digs into that reality rather than pretending it doesn’t exist. After a childhood spent dealing with microaggressions about her weight, teenage Kate actively decided to slim down to her “goal weight” of a size 7. But once she achieved that goal, she realized it didn’t give her the relief and satisfaction she thought it would. As Kevin observed during their family therapy session, Kate’s body image issues run much deeper than just the aesthetics of how she looks. And while I thought we were in for a more simplistic story about teenage Kate not being able to fit into the dress she wanted, This Is Us offers something less melodramatic and more emotionally complex. And that’s true of Kate’s trip to the wedding dress boutique as well. One of the themes of “Clooney” is that things aren’t always how they appear. Madison might seem like a put-together woman with a weird need for attention, but her eating disorder is very real, even if it isn’t obvious to the outside world. And although William’s old building might look like a rundown apartment complex, inside is a thriving community of people who don’t have access to the resources they need. In trying to search for details about his father’s life, Randall stumbles upon a new way to honor William’s legacy: By buying the building and supporting the community inside. Though no one’s more surprised by this than me, I actually found Randall’s to be the weakest of this week’s storylines. There’s a meandering quality to it that—while likely an intentional storytelling choice designed to reflect Randall’s scattered state of mine—just didn’t quite work for me. I also find it weird that Randall’s search for William’s ex-lover comes before we’ve seen Randall have any kind of meaningful conversation with William’s boyfriend Jesse. 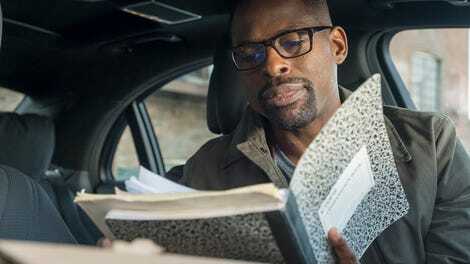 Still, Sterling K. Brown and some charming guest performers make the storyline more than watchable. And the reveal that William was writing poems to Billie Holiday a.k.a. Lady Day rather than a real-life lady friend fits with the episode’s more low-key approach to its storytelling. Which isn’t to say that “Clooney” isn’t emotional. It’s just that the characters themselves aren’t doing a ton of explosive emoting. They’re simply living their lives and, in a way, experiencing moments that are even more powerful to us than they are to them. Though Randall and Clooney never actually cross paths (Clooney instead finds another family that needs him), William’s instinct to help a stray cat is mirrored in his son’s instinct to help a building full of people. And while it’s clear that buying his first suit with his father is something teenage Kevin appreciates in the moment, it means even more to us knowing that the amount of time Jack has left is very, very limited. That’s why it’s a shame that this episode goes and undoes all that relatively subtle storytelling with an ominous shot of the Pearson’s battery-less smoke detector as Rebecca and Jack wonder aloud if they forgot anything at the mall. Oh well, the lack of melodrama was nice while it lasted. Jack Death Watch: It really feels like the next time we revisit the late 1990s timeline it will be to witness Jack’s death. We’ve caught up to all the “clues” from the second season premiere (Kate’s dog, Kevin’s cast, Randall’s girlfriend), and that shot of the smoke detector really doesn’t bode well. The feeling of being a teenage girl headed into a dressing room with three different sizes is palpably relatable and something I’ve seldom seen on TV before. I love what this season has done to deepen Madison as a character and I particularly enjoy Caitlin Thompson’s slightly off-kilter performance in the role. It’s also nice to see This Is Us give Kate another important relationship beyond the one she has with Toby. Teenage Randall asking a girl out with a homemade Magic 8-Ball was super adorable and very Randall. Great casting (is that the right word?) and styling on that stray cat.